Club Brugge Koninklijke Voetbalvereniging, known as just Club Brugge, is a football club based in Bruges in Belgium. They were founded in 1891 and play at the Jan Breydel Stadiu with a capacity of 29,472. Club Bruge are considered one of the most successful clubs in Belgium and have been Belgian league champions on 14 occasions. Only major rivals Anderlecht have won more. Similar to Inter and AC Milan, Club Bruges share their stadium with city rival Cercle Brugge, the team they contest the Bruges derby with. Club Brugge have enjoyed a lot of European football success having reached two European finals and two European semi-finals. Club Bruggeare the only Belgian team to have played in the final of the European Cup (now known as the UEFA Champions League. They lost this final to Liverpool in 1978. This post is written by @Casual_FM_, you can find him over on Twitter. 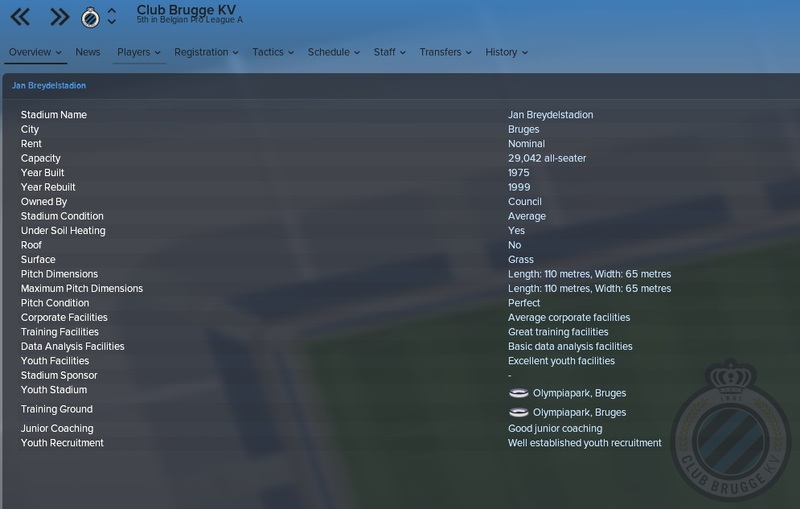 Enjoy his club guide on Club Brugge! Dutch Midfielder Jordy Clasie is a 25 year-old with some decent attributes including first touch and passing. He is on loan at Club Brugge and is on £37.5k a week. He is definitely one of your best-rated players at the club and I would urge you to use him for the one season he is on loan from Southampton. He is amongst the highest quality of players in the Belgian Pro League A.
Hans Vanaken is my other pick for a top player at the club; partner Clasie alongside this man and you’re surely in for a fantastic season! The Belgian man has some impressive attributes along with good composure and decisions which are both key when playing in a central midfield area. Wingers or wide-players would be my one position to improve in this side. Currently, there is only Lior Refaelov who could do a fantastic job on the wing. With tactics that use two wingers, you would need another quality player to play on the opposite side to him. However one of our top hot prospects is a winger, so you might well choose to opt for youth. Our first hot prospect in the Club Brugge ranks is Dennis Bonaventure. He could, and perhaps should, be used as one of your first choice wingers. As I mentioned earlier on the wing is one key position to improve in this side. If you develop this 19 year-old correctly he could be the player you desperately need in your side. Our second hot prospect is a Defensive Midfielder who goes by the name of Jordi Vanlerberghe. To me, he looks like he has the potential to become an integral part of your squad. He is already valued at £2.1 Million and the 20 year-old Belgium should feel right at home in a ball winning midfielder role. 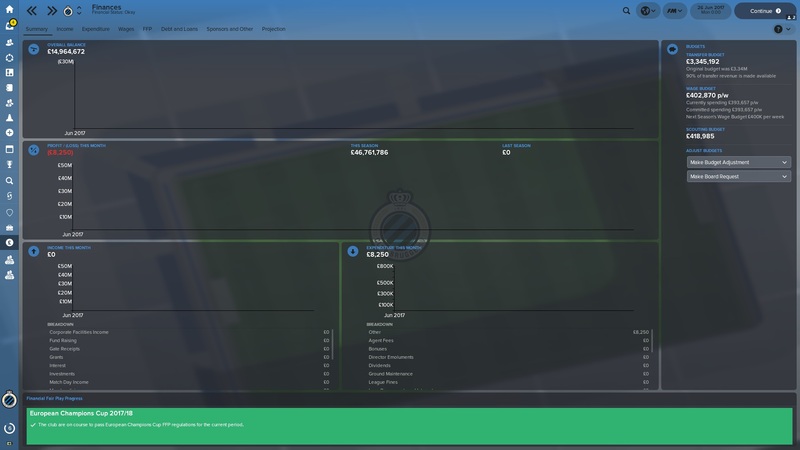 Club Brugge have pretty decent finances with around £400k on the wage budget and also around £3.3 Million in the transfer budget. Remember to spend wisely though and not go crazy with your budget, make sure you make the right signings at the right times or you could quickly make the club bankrupt. 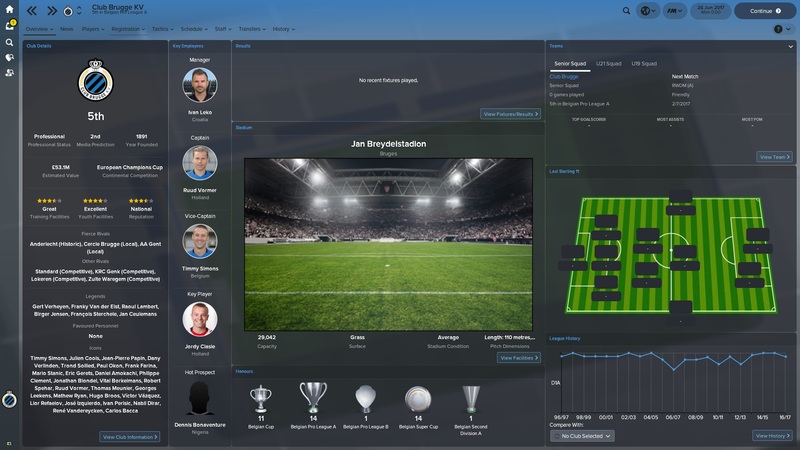 So good luck to everyone who manages Club Brugge and I hope you have a fun time over in Belgium, please let me know how you get on in your saves either in the comments by heading over to my Twitter @Casual_FM_. Thank you for taking the time to read this club guide! 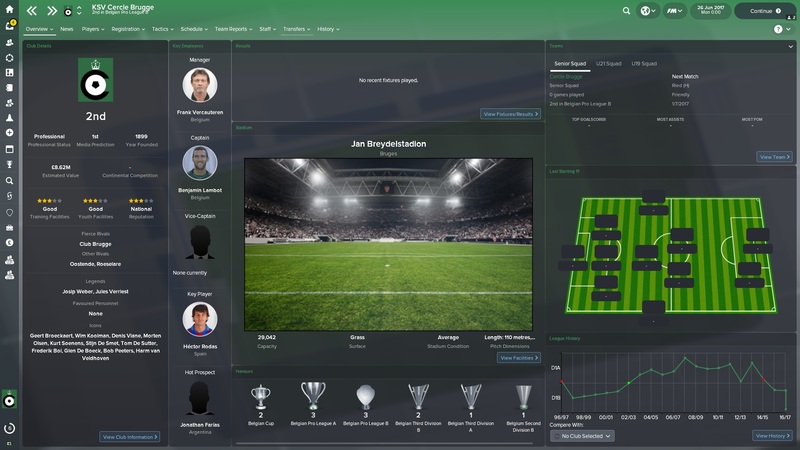 This entry was posted in FM Guides | Club Guides, FM18 Guides, Experiments & Wonderkids, Football Manager 2018 and tagged belgian pro league, belgium, casual_fm_, club brugge, FM Guides, fm18, football manager. Bookmark the permalink.